Sometimes, fusion is not necessarily a bad thing. Take the French colonization of Vietnam - it yielded such delicious creations such as Pho and Banh Mi. We can denounce the colonization part of the equation, but the culinary by-product is the world's gain. So with that in mind, we finally see an establishment in Vancouver take this head on by offering a predominantly French menu with Vietnamese elements (of course influenced by French cuisine). 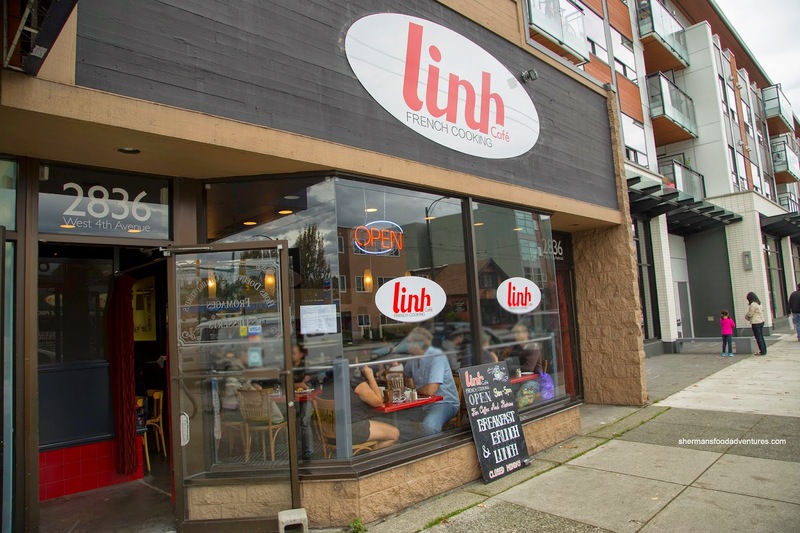 Linh Cafe, situated in the old location of Cafe Regalade, is that very place that offers up items such as Cassoulet along with Pho and pastries. I gathered up the family with the grandparents for this food adventure. 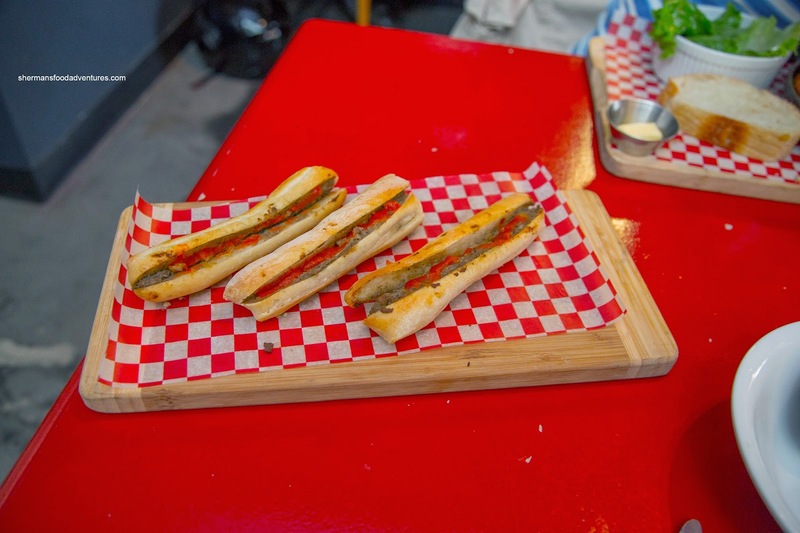 For the table, we started with the Banh Mi Cay Hai Phong or Spicy Baguette Sticks. These were super crusty as they were well-toasted. Inside, the mini baguettes were airy and light. With an ample amount of pate, there was no shortage of moisture and flavour. The pate was smooth with meaty nuggets where it was well-spiced with a peppery finish. Of course, with a drizzle of hot sauce, there was a nice kick that didn't overwhelm. We also tried a couple of their Croissants which ultimately disappointed. These were heavy, doughy and not crispy at all. Inside, the pastry was dense and too "wet". The kids still ate it, but for me, I thought they were terrible. At the very least, they weren't very big as they were more like mini-croissants that cost only $1.95 each. 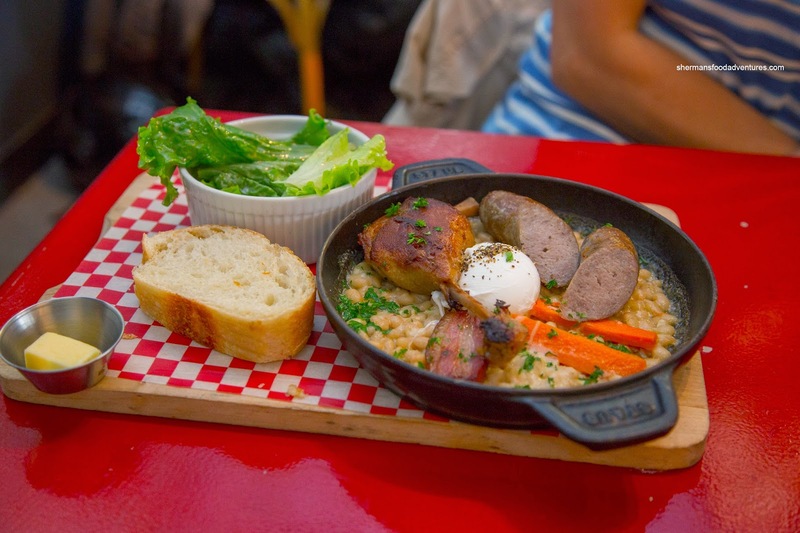 Viv decided to try the Cassoulet with duck confit, sausage, bacon and white beans. She added a poached egg for 95 cents extra. We found the duck leg to be well-prepared where the skin was nicely rendered and crisp. The meat was succulent and mildly seasoned where the natural flavours came to the forefront. Meaty and firm with a natural-tasting gaminess, the sausage was also a bit mild with a slight salty finish. The ample amount of white beans were soft while still retaining a bite. We would've liked to see the bacon cooked a bit more as it was a bit chewy. 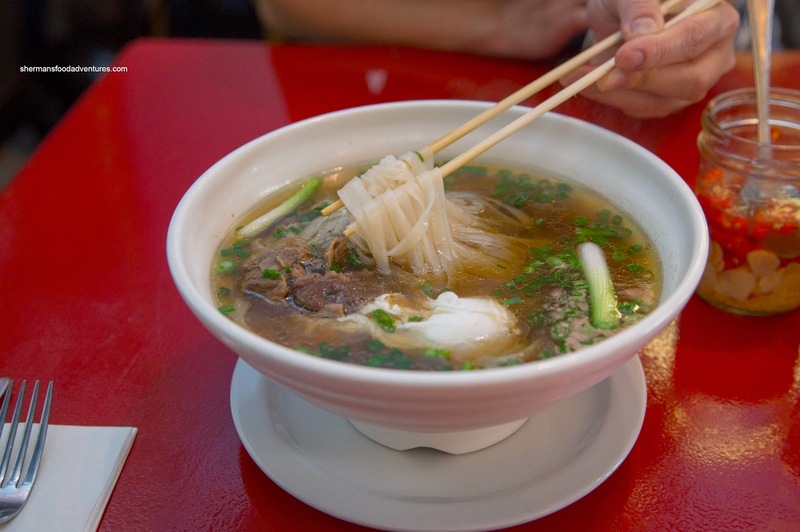 For myself, I went for the Pho Bo (Hanoi Breakfast) with braised beef flank and rice noodles. I also added a poached egg for 95 cents. Since this was the Northern version, it came with the obligatory pickled chilis and garlic. I thought the broth was clean and meaty while being very light with the sodium. There was a bit of residual grease which provided a nice essence. The rice noodles were slippery being past al dente. I enjoyed the little nuggets of super moist beef, but there was very little of it. 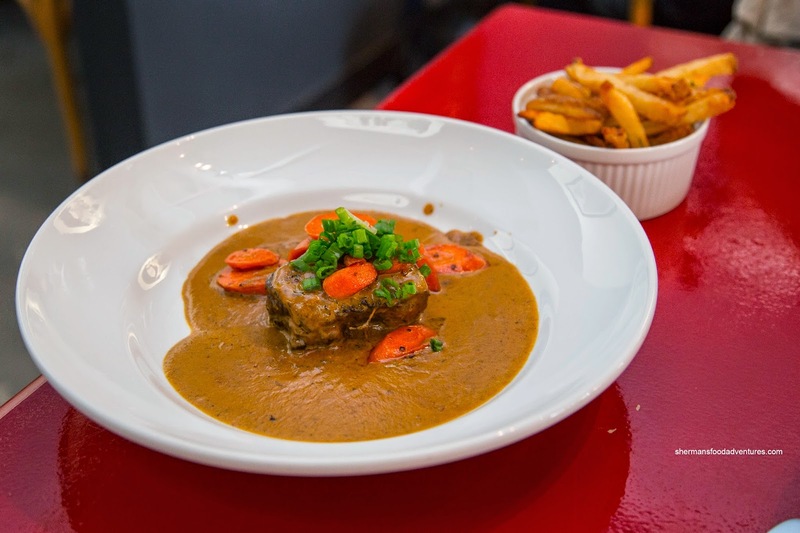 My mom ended up with the 7-Hour Braised Short Ribs with peppercorn sauce, honey glazed carrots and frites. The modest portion of beef short rib was tender, yet not completely moist. Again, it wasn't aggressively seasoned where the natural beef flavour really came through. However, the creamy and peppery sauce added all the necessary flavours without relying on salt. I found the sweet carrots to be a nice accompaniment as it stayed in the background while still adding a certain understated sweetness. As for the side of frites, they were crispy, yet a little dense. With probably the best dish of the bunch, my dad had the Chicken Fricassee with chicken legs, tomato confit, preserved lemon and couscous. 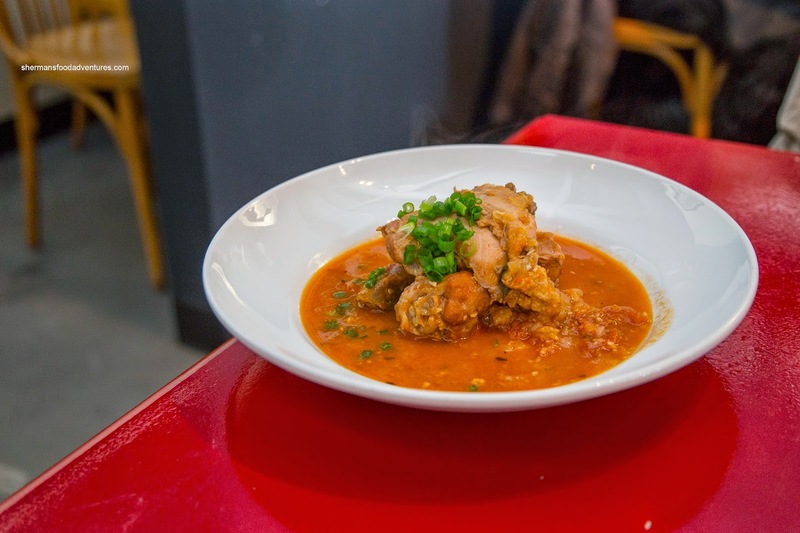 Normally, I'm as excited about a chicken dish as much as navigating a parking lot in Richmond. But this was expertly executed with succulent chicken meat that was well-seasoned with preserved lemon. Hence, there was an overall brightness and appetizing flavour that was further accented by the sweet and slightly acidic tomato confit. 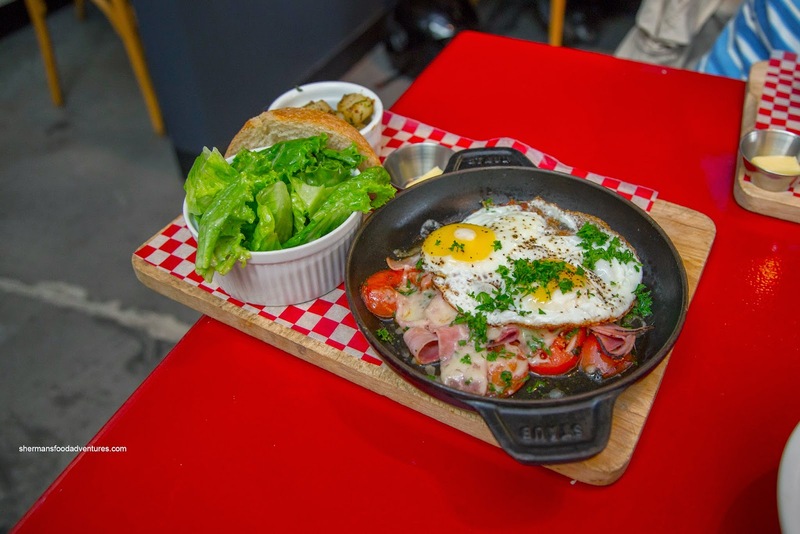 For the kiddies, they shared the Paris Breakfast consisting of 2 sunny side up eggs, cooked ham, pan fried tomatoes, Swiss cheese, potatoes and salad. Although the egg yolks were still runny, the rest of the egg was fried until crispy where we could really taste the butter. The mixture of ham, cheese and tomatoes had a bit of everything including a notable saltiness from the ham and sweet-tartness from the tomatoes. Overall, we were pleased with the dishes we sampled. 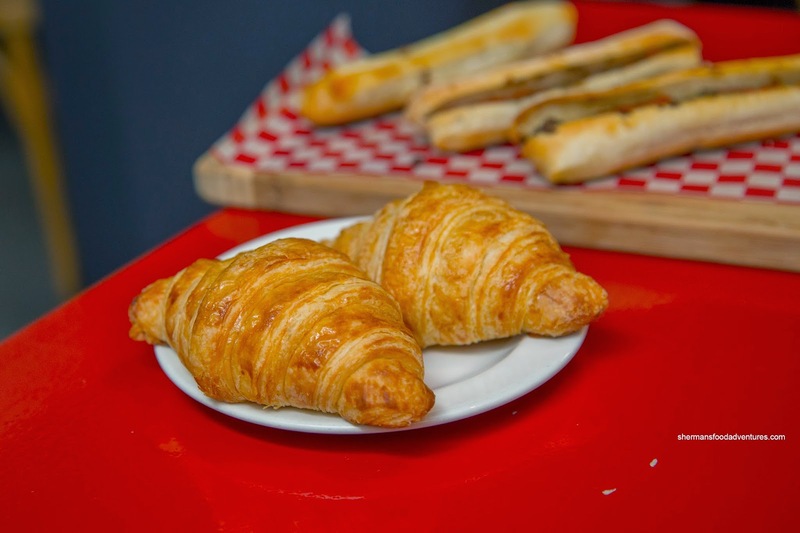 Sure the croissants were not very good, but most everything else was tasty without an over-reliance on salt. Good to have a Vietnamese fusion resto, let alone Vietnamese, on the west side. Do you recommend Linh, aside from the failed croissants ? @LR Yes, I would definitely recommend it. "In 2001, Tai made a life changing decision move to Vancouver, where he developed a love for French cuisine. His experience was enriched at the award-winning French restaurant L'Emotion (West Vancouver), where he worked under the tutelage of Executive Chef Jean-Yves Benoit. He further apprenticed at the renowned French restaurant La Régalade (West Vancouver) before moving onto Mistral French Bistro(Kitsilano), reuniting him with Chef Benoit. In 2011, Tai rejoined Café Régalade with Steeve Rayé in Kitsilano. After one year, Tai joined the team of Chef Thierry Busset at Thierry Chocolaterie Patisserie Cafe (Downtown Vancouver) to further experience pastry skill till 2014."